In the wake of the financial crisis, companies have struggled to meet investor expectations and remain competitive on the international stage. Faced with challenging financial conditions, companies have focused on cost-cutting measures, while exploring opportunities in emerging markets and developing new products and services. Unfortunately during these conditions, incidents of accounting errors and misconduct are on the rise as employees may become tempted to cut corners. This webcast features an all-star panel of lawyers and forensic accountants with experience investigating accounting misconduct. The distinguished panel will address the type of accounting misconduct that may be prevalent in these times including revenue recognition issues, questionable capitalization of costs, manipulating prepaid expenses, failure to account for contingent liabilities, channel stuffing, and round trip transactions. 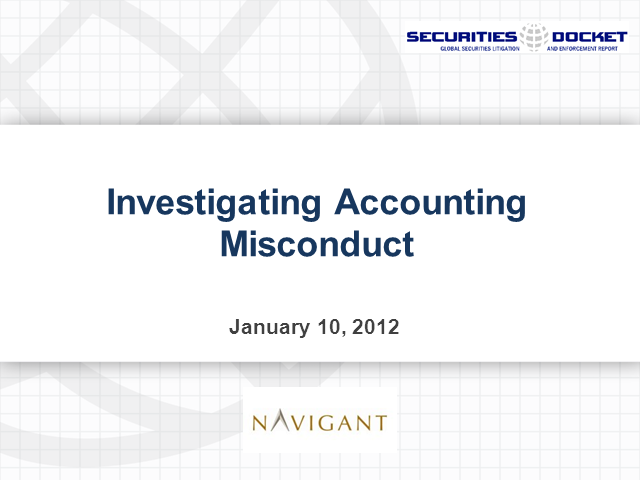 The panelists will address the investigative techniques both from a legal standpoint and a forensic accounting standpoint to identify and catch accounting misconduct. The panelists also will address best practices for structuring internal investigations into accounting misconduct and for responding to SEC investigations.